Isn't this time of year great?! The hectic holidays are over, the decorations are mostly put away, we are back to work and our routines...there is time to take a breath and catch up on things that need catching up on. That's what I was doing when I made a discovery. Last year, my wife Ellen gave me a fabulous subscription to a magazine called "Italia!". This monthly publication is about...you guessed it, Italy! The byline of their magazine, published in Great Britain, is "Holidays - Property - Food - Wine - Culture - People". I enjoy reading this magazine each month. I especially like the sections on food, as there are excellent recipes in each issue. And each issue is dedicated to a different region or town of Italy, so you get a smorgasbord (not sure there is an Italian word for that) of regional dishes over the years. As I write this, I had just taken a few moments to catch up on my Italia! reading when I picked up the September, 2016, issue. Travel and the holidays had created neglect on my part in staying abreast with the Italian scene. As I do with each issue, I was tearing out page after page to save articles for later reading and recipes for later execution (this issue has some great recipes for appetizers from Venice, as well as some pasta sauces), when something caught my eye. There on the "Readers Photo Competition!" page near the front of the magazine was one of my photos. I had submitted it several months past, and I was pleasantly surprised to find that it had won the first place award for that issue. My prize? A free one-year subscription to Italia! I was thinking that you might have seen this photo before in one of my photo transformation articles, but as I looked back, I saw that I have not done that...until today. So, what follows is how this winning photo came to be. But first, a reminder about just what a 'water gate' is. 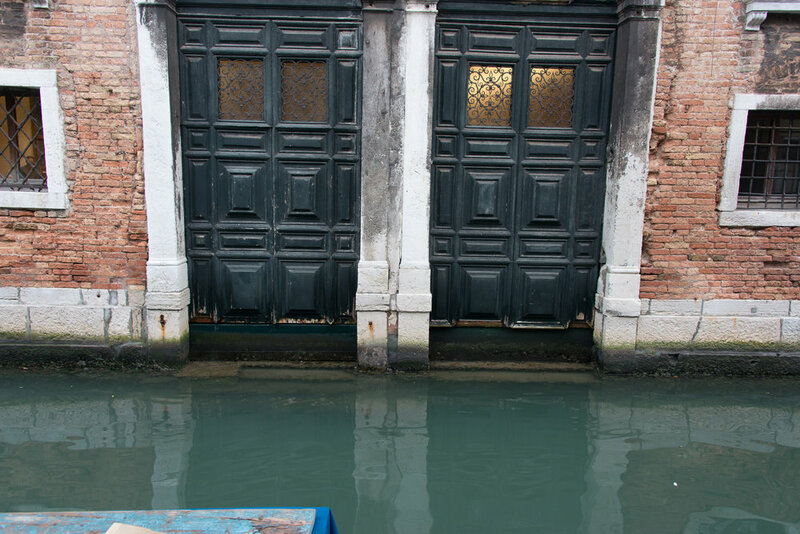 As small canals crisscross Venice, most of the larger palazzo have entrances at both a pedestrian level from the walkways of Venice, but also at the water level. Remember that Venice is a city of walking and boating...and that's it. When you go to visit your friends, it was, and is, just so much nicer to go by gondola and be dropped off at a water gate, like this one. And it is much easier for the supplies for your home to be dropped off by boat, rather then being hauled over bridge after bridge on their way to your home. As I was standing directly across a small canal from this water gate, I was just a bit difficult to get the whole of the door and its surroundings into one photo. So I took three photos and stitched them together in Photoshop. Are are the original three photos. And here is the photo that resulted after stitching these three together into one image. If you want to see any of the photos below in greater detail, just click on the image. As you can see, the resulting image is a bit wonky, and it needs a good bit of adjustment, so that's what I did. But, before I go there, I have to admit that I am constantly amazed as I make my photo transformations -- of Venice in particular. That rather blah, unassuming snapshot above does absolutely nothing aesthetically for me as it now stands. But, that challenge of making magic to give you that Venice of another age is what drives me in my transformations. Here is what the image looks like now. The composition is just as I want it. The elements of the photo -- the brick, stone, wood and glass -- are just as I want them, too. And I really like the warm, yellowish glow coming from that one panel on the door to the right. I'm thinking that this particular element is what I need to enhance to make this image into a fine-art photograph. So, here is this water gate after working that nice evening glow into all of the glass elements of the photo. But remember, this evening glow has nothing to do with the evening, as the original snapshots were taken during the day. So my final job is to transform this ancient, Venetian, functional water gate, into a sight as you might have seen it one evening as you strolled Venice in another time. Here is the final image. As you can see, I've emphasized the texture of the brick and stone work, and the glass transmits that nice glow from within this timeless building. And I've tried to call attention to the ubiquitous, relief-carved keystones of the archways of Venice, as well. Finally, I hope that I've cast just enough late-night light onto the subject, for you. Now, take a moment to think about what is going on behind those doors. And perhaps what has gone on behind those doors over several centuries...remember, Venice is well-over a thousand years old. I was pleasantly surprised to find my photo as the winner in Italia! magazine. I hope that you are pleasantly surprised at today's transformation. Interested in receiving Italia! magazine yourself each month? Click here to see how.